See more objects with the tag interior, decoration, home, overlapping, nature, curving line, brass. This is a Armchair. It is dated 1880–90 and we acquired it in 1986. Its medium is steer horn, wood, metal, brass, glass, leatherette (not original). It is a part of the Product Design and Decorative Arts department. Trained as a cabinetmaker in his native Bohemia, Wenzel Friedrich immigrated to the US in 1853, settling in San Antonio and opening a revival-style furniture business. In 1880, he became more innovative, realizing the potential of the Texan stockyards’ plentiful supply of longhorn for use in furniture design. 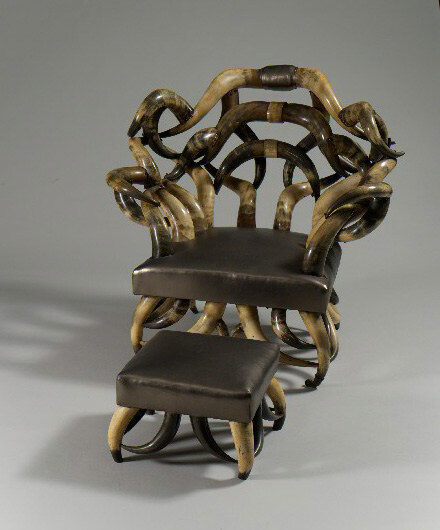 In Europe, antlers, horns, and other emblems of the hunt were used as decor as early as the fifteenth century, with horn seat furniture popular in the 1800s. It is likely Friedrich had seen horn furniture first-hand in Europe or in publications of international exhibitions, where it was shown. Friedrich’s longhorn furniture fulfilled the Victorian fancy for the unusual, as well as symbolized the Wild West, whose air-of Manifest Destiny was desired, as the West became increasingly linked to the Eastern seaboard. Friedrich’s horn furniture was popular in local male-dominated taverns, smoking dens, and bordellos, but was used in more sophisticated settings overseas—England's Queen Victoria even owned a piece. He used boiling water to soften the raw material’s exterior surfaces, which were then scraped, cleaned, dried in the sun, and buffed. Boiling water also made the horn pliable, allowing Friedrich to create exaggerated curves for his various tables, settees, hat racks, and benches. This object was donated by Jack Lenor Larsen. It is credited Gift of Jack Lenor Larsen.